I have made this dessert a number of times. For me, an Apple Upside Down Cake is a delightful combination of caramelized apples with ground cinnamon and chopped nuts(optional). My husband is not a big fan of cinnamon so whenever I make this dessert, I omit our oldest spice cinnamon. For those who love cinnamon flavor, do not add more. Adding 1/2 teaspoon of cinnamon is sufficient. If you add more, then the cinnamon flavor would dominate the delicious caramelized apple flavor. For those who dislike cinnamon, omit the cinnamon and make the recipe as given below. I sometimes serve it over an icecream. Apple Upside Down Cake dessert is certainly an easy one to make. Basics of baking a cake, Cake baking problems & causes, How to Preheat the Oven? 2. In a small bowl, combine sugar and cinnamon and set aside. 3. In another big bowl, blend butter, sugar, flour, egg, baking powder, and essence one after the other. Whisk well. 4. Grease the cake pan. Cut apples in a desired shape and arrange the cut apples in the pan. The layer of the apples should be thick (preferably 1 -2 inches thick) otherwise the baked apples would turn into applesauce. Then, sprinkle little sugar cinnamon mixture. 5. Pour the blended cake batter over the apples. Sprinkle the remaining sugar cinnamon mixture. Bake the cake for 30 minutes or until you get a good aroma of the apple cake. Check if the cake is ready by running a toothpick. If it comes out clean, then the cake is over.Do not check the cake in between by opening the oven for the first 20 minutes. 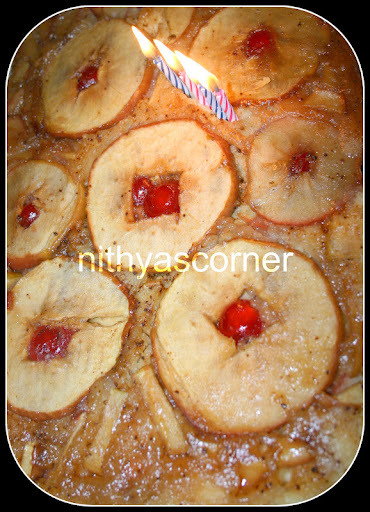 Now, Apple Upside Down Cake is ready!!! This entry was posted in CAKES & BAKES and tagged Apple, Apple Upside Down Cake, caramelized apples, cinnamon flavor, ground cinnamon on November 22, 2014 by vikashbhardwaz. 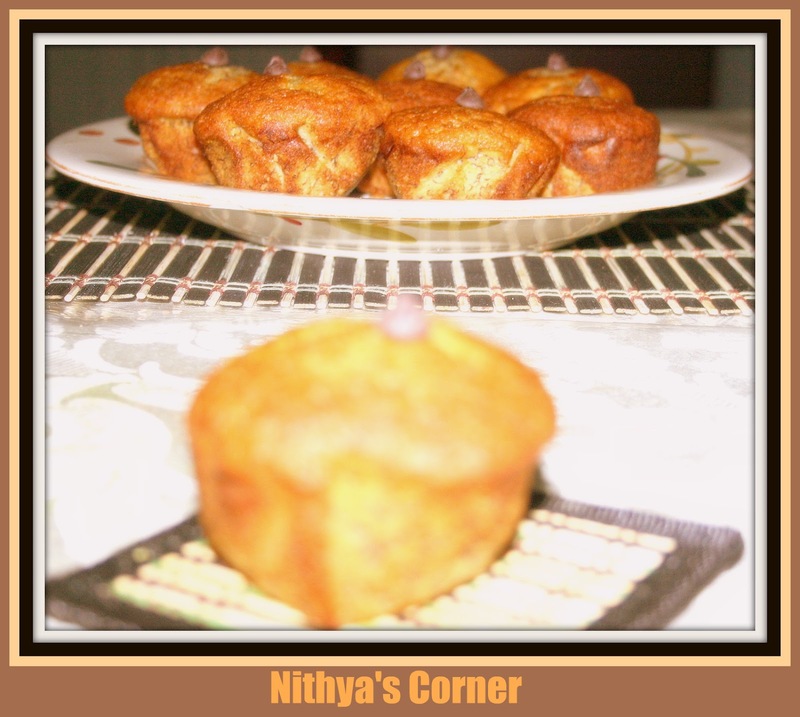 A very easy muffin to make. I just love the flavor of bananas when you eat this muffin. It would be very soft and rich in banana flavor. sometimes, I would add chocolate or vanilla chips or even some nuts. When I have ripe bananas and have to finish it off soon, bananas become muffins in my house. My family just loves them! Definitely worth giving it a shot! Mashed bananas – 3 nos. 1. Preheat oven to 350 degrees F. Grease muffin pans with non-stick spray or use parchment paper. 2. In a bowl, sift together the flour, baking powder, baking soda, and salt. 3. In a large bowl, combine bananas, sugar, egg, and melted butter one by one. Then add the flour mixture little by little and mix until smooth. Note. After placing the muffins in the oven, do not check the muffin in between by opening the oven for the first 20 minutes. 4. If it is mini muffins, bake it in preheated oven for 10 to 15 minutes. If large muffins, bake it for 25 to 30 minutes. Run a tooth pick and if the tooth pick comes out clean, then the muffins are ready. 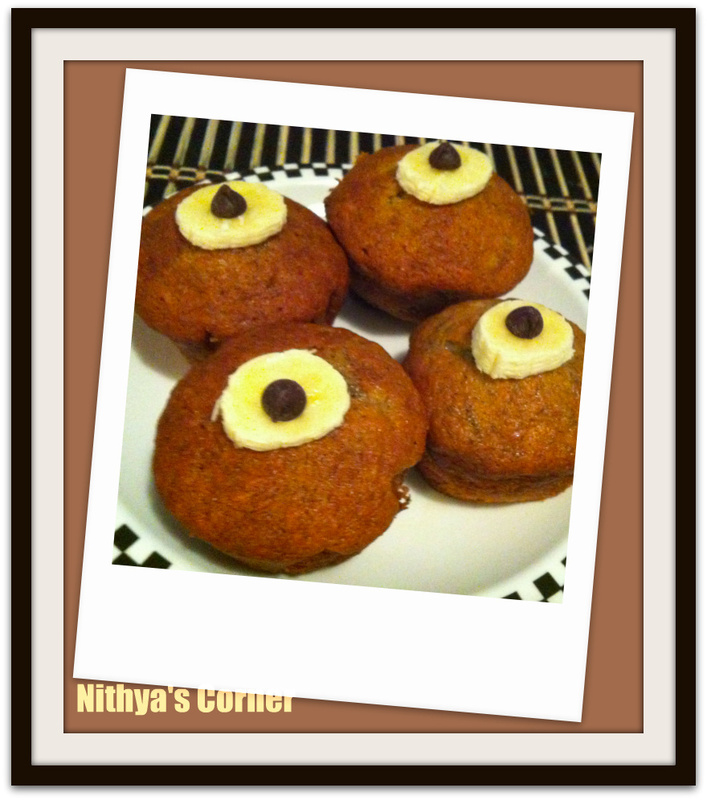 Now, Banana Muffins are ready!!! Use the ripest bananas as they have much more flavor. Can also add pecan and walnut pieces. This entry was posted in CAKES & BAKES on November 22, 2014 by vikashbhardwaz. 1. Preheat oven to 350 degrees. Line the cupcake pan with cup cake wrappers or grease the cupcake pan with butter and then dust it with all purpose flour. I have used cupcake wrappers as it is very convenient to eat as well as to clean the pan. 2. Finely grate the carrots. Sieve the all purpose flour and baking powder to remove any lumps. 3. In a large mixing bowl, combine the grated carrots, all purpose flour and baking powder. Add sugar and baking soda to the all purpose flour mixture. Using a spatula, mix it once. 4. Then, add vegetable oil, eggs and vanilla essence. Mix at low speed for 30 seconds. Then mix at high speed for 3 minutes. 5. Pour batter into cupcake wrappers until they are 1/2 to 2/3 full. Bake for 20 to 25 minutes. Note. Do not check the cake in between by opening the oven for the first 20 minutes. 6. Use a toothpick to check if the cup cakes are done. If the toothpick comes out clean, then the cupcakes are done. Cool 10 minutes in pans then move to wire rack to cool completely. Now, Carrot Cupcakes are ready! Usually carrot cupcakes are very good with a cream cheese frosting. You can also garnish it with candied carrot curls. Do not use pre-shredded carrots. You can use a pinch of ground nutmeg or 1 teaspoon of ground cinnamon as a substitute for vanilla essence. You can also garnish with chopped walnuts. Store the leftovers in an airtight container in the refrigerator. This entry was posted in CAKES & BAKES and tagged baking powder, cupcake wrappers, vanilla essence on November 22, 2014 by vikashbhardwaz. A fruity and a moist cake - an old-fashioned favorite! I made this cake for a get-together and it turned out to be a blockbuster. Everyone simply loved this cake and since then whenever we have a get-together, they request me to make Pineapple Upside Down Cake. If I have a pineapple tin at home, then I usually make this cake and serve as a dessert.Sweet lovers, think twice….may be even thrice… before adding an extra cup of sugar as it would dominate the lovely taste of caramelized pineapples. I am sure if you follow the ingredients given below, you will get the perfect sweetness. 1. Heat oven to 350°F degrees. Apply butter on the cake pan. Drain pineapple (reserve 2 tablespoons syrup). 2. Melt butter over low heat and add brown sugar. Keep stirring until sugar melts and remove from heat. Arrange pineapple as desired in the cake pan. Now, pour the brown sugar on top of the pineapples. 3. In a medium bowl, mix flour with sugar. Add shortening and milk. 4. Mix at medium speed 2 minutes. Add egg, milk and pineapple syrup. Beat for three more minutes. 5. Pour cake batter over pineapples in the cake pan, spreading evenly. 6. Bake 40-45 minutes and use a toothpick to check if the cake is done. Now, Pineapple Upside Down Cake is ready!!! 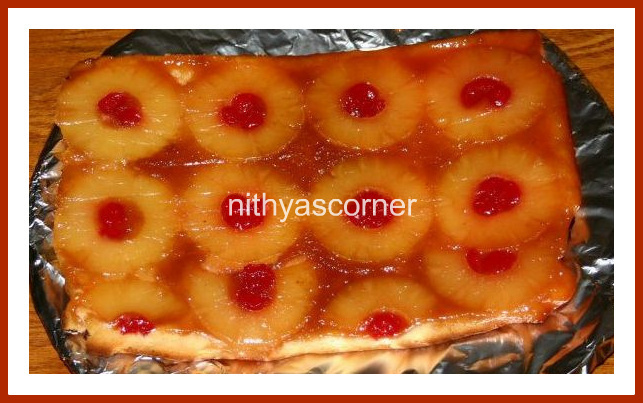 This entry was posted in CAKES & BAKES and tagged Brown sugar, cake pan, moist cake, Pineapple Upside Down Cake on November 22, 2014 by vikashbhardwaz. 1. Preheat the oven at 350 F. Take a bowl, beat the butter and sugar using the hand mixer. 2. Add an egg and beat well. 3. Now add another egg and beat well. 4. Add vanilla essence and beat for few seconds. 5. Mix the dry ingredients (flour, baking powder, salt) in a bowl. With a mixer at a low speed, alternatively add flour mixture and milk to the sugar/egg batter. Beat it for 2 mins till fine batter is formed. 6. Now line up the cupcake pan with paper liners. Fill the cup evenly with the batter. 7. Bake for 18 to 20 minutes until a toothpick inserted in the cupcake comes out clean. 8. Remove from the oven and cool it for 20 minutes. Now Vanilla Cupcake is ready! This entry was posted in CAKES & BAKES and tagged baking powder, Vanilla extract on November 22, 2014 by vikashbhardwaz. I made this Vanilla Strawberry Cupcake for my baby Shreeya’s 1st monthsary birthday. I could not plan much as my elder one was keeping me busy all the time. When I was thinking for some easy cake ideas, I landed up with this recipe. It was very easy to make. I actually planned to make a basicVanilla Cupcake and then thought of adding some strawberry pieces into it. I then added strawberry pieces and believe me, it came out very well. Initially I thought of posting Vanilla Cupcake and Vanilla Strawberry Cupcake as a single recipe /post but then thought will post it as two recipes. Hope you like both Vanilla Cupcake and Vanilla Strawberry Cupcake. 5. Mix the dry ingredients (flour, baking powder, salt) in a bowl. With a mixer at a low speed, alternatively add flour mixture and milk to the sugar/egg batter. Beat it for 2 minutes till fine batter is formed. Then add finely chopped strawberries and stir well. Now Vanilla Strawberry Cupcake is ready! This entry was posted in CAKES & BAKES and tagged Strawberry Cupcake, Vanilla Cupcake, Vanilla extract on November 22, 2014 by vikashbhardwaz. This entry was posted in Cakes With Eggs and tagged Apple, Apple Upside Down Cake, baked apples, caramelized apples, cinnamon flavor, ground cinnamon on November 22, 2014 by vikashbhardwaz.